It was a great pleasure catching up with Nancy and Kyra our re-bound Rotary Exchange Students at a recent meeting. This was a great night where both girls told us about their experience while being away for 12 months as part of the Rotary Exchange Program. Nancy (to Taiwan) and Kyra (to Denmark), both had very different experiences culturally however their overall experience was similar and were so glad they had the opportunity to go. We were able to present Rotary Alumni pins to both students, welcoming them into our Family of Rotary. On night we also had friend of Rotary, Allison at the meeting who was a Rotary Exchange student some years ago (we won’t get into specifics!) to America. We were able to present her with an alumni pin as well which I know she was surprised to receive. It was also lovely to have her mother in attendance to share the presentation. 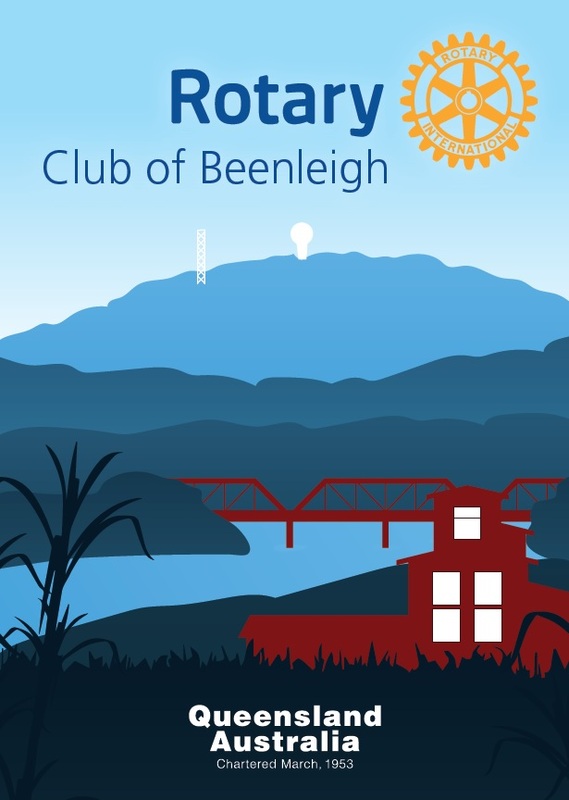 We have had some successful Club Beenleigh raffles done in conjunction with the Rotary of Loganholme and have all enjoyed fellowship and a lovely meal after the event at the Bull’n’Barra Restaurant at Club Beenleigh after. We had our marquee and display at the official unveiling of the Tree of Life mural in Beenleigh Town Square, which was painted by Don Waters our famous local Artist. Organised by Junior Quota it was a great community event that we were delighted to support. On Wednesday the 1st of May the Rotary Club of Beenleigh is hosting an Art, Wine and Cheese evening at Seasons Resort Waterford West for residents, their families and members of the community. There will be a mega raffle on the night and all proceeds will go to Relay for Life which is being held in Beenleigh on the 18th of May. We are ecstatic that the aforementioned Don Waters will be our special guest on the night. We are also thrilled to announce that Logan City Council has come on board as Major Sponsor for our community Pride of Workmanship and Vocational Awards night, which will be held at Club Beenleigh on in September this year. We are still looking for four sponsors for the individual major awards. If your business or a business you know of may be interested in sponsoring one of the award categories please get in touch with Gary Hollindale on 0439 755 373 or John Mulraney on 0414 469 889 for further details. I had the pleasure of talking to the Logan City Chaplain group this month about what we may be able to offer the group with support in the schools they service within our community. I look forward to working closer with the Logan Chaplain’s in the future. We were again offered the opportunity to assist with the Belivah Creek Community Tree planting day by providing a free sausage sizzle and drinks for the hard-working tree planters. These days are always a highlight especially for our members with young children, as it is a great activity for the whole family to get involved and plant a tree or two (or several!). We thank the Logan City Council for including us again in this great day. Late March, I had the pleasure in attending the President Elect Preparation Seminar in Toowoomba. I will continuing on with the Rotary Club of Beenleigh’s Presidency for the 2019-20 Rotary year. The seminar was less daunting for me than last year and I have come back to the club with some exciting ideas for the coming year. It was wonderful to talk with other clubs and share ideas for projects they are involved with. As our club continues to grow it enables us to work on larger projects for our community. Our club is always open to ideas for community projects, so if you have any ideas please let us know about them. While I was away at the seminar, we also had a very successful BBQ at Bunnings Bethania, our first for the year. From all reports, it was great to see everyone having a great time. We would like to sincerely thank members and friends of Rotary who were able to help us. We have another BBQ on Saturday the 27th of April so if you can assist please get in touch.